Welcome to the information page for vendors here at Cecil Con 2019. Below is information about becoming a vendor at our convention. Applications are online only. Vendors must set up their space or table by 10am on April 13th. The Vendor Hall is ONLY OPEN SATURDAY from 10-6pm. 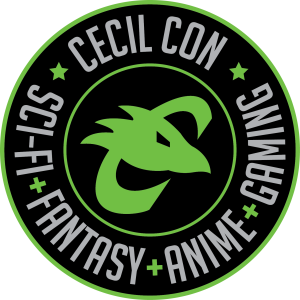 Cecil Con associates reserve the right to reassign unclaimed tables by April 13th, at 9:30am. – Absentee vendors cannot reclaim their table after 9:30am and will not be eligible for a refund. – Reassigned tables will be sold at the standard rate. The Artist Alley/Vendor’s Hall is located inside of the Phys Ed building, first floor, in the gym. To access the unloading area, drive to the backside of the Phys Ed building. Cecil Con associates will be available to help direct and unload.